Pity clueless musicians who spend more time on their music than their image. If they want to be rich, really rich, they should follow the model of one of rap's richest stars, Curtis James Jackson III, a.k.a. 50 Cent. He may have gained his fame at the microphone or by receiving nine non-fatal gunshots, but his $400 million-plus fortune comes from another source: endorsements. Taco Bell, which attempted to use his image without paying him for it, has found just how jealously he guards his money-maker image. In 2008, Taco Bell publicly asked 50 Cent to consider changing his name to 79 or 89 or 99 Cent, to promote the chain's "79-89-99-Cent Why Pay More?" campaign. The company even sent copies of the request letter to news outlets, as well as the artist. They had not, however, made any arrangements with 50 Cent to use his name. When the rapper filed a $4 million lawsuit against Taco Bell for using his image without permission, the company countered with the charge that 50 Cent was attempting to enhance his street cred and notoriety by making an issue of the issue. The suit has now been settled, and while terms have not been released, I'm presuming The Bell took a hit. And rightly so. How, I wonder, could Taco Bell have been so clueless in its theft of 50 Cent's image? The value of such endorsements is enormous. Much of his personal fortune came from the sale of Glacéau Vitaminwater to Coca-Cola in 2008. 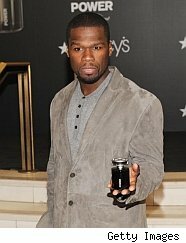 Since 50 Cent owned a piece of the company as part of his endorsement deal, he netted an estimated $100 million. And 50 Cent is no naive celebrity likely to overlook such an appropriation; in fact, he's an aggressive businessman when it comes to parlaying his brand. For example, Macy's recently began selling his fragrance, Power by 50. Reebok has done very well since 2003 with the 50-Cent-endorsed G Unit line of shoes. He has inked contracts with Right Guard for body spray (Pure 50 body spray) and has been laying plans to market his own brand of platinum (the metal, not the record sales award). He has also developed his own line of condoms, Magic Stick, and even co-wrote a novel, The Ski Mask Way. Perhaps not coincidentally, 50 Cent and MTV have just announced that the performer will act as host for a reality show, which revolves around 16 hip-hop-hopefuls who will share a house and compete in business-related challenges to determine which one has the right stuff to become a mogul. I'm guessing endorsements will be one of the contests. Perhaps Taco Bell should send one of its marketing people to compete; they might learn something.